A Toast to Silence challenges and rejects conventional thinking about police encounters, openly stating what is only whispered: the police lie. When police stop you, they exploit our popular culture of media-driven misinformation, your needless fear of arrest, and addiction to talking. Using misinformation and deception about your right not to answer questions and not to take sobriety tests, cops, with clever, friendly conversation that skillfully disguises lies, fool millions of Americans who are clueless about their right to remain silent into convicting themselves. A Toast to Silence shows how the seemingly forgotten right to silence, when used correctly at the right time, neutralizes ever-growing police power and ever-creative deception tactics. It details word for word what cops say to trick you into giving evidence, the basis for guaranteeing your arrest and conviction, before they recite to you the Miranda warning. It exposes and closes the wide truth gap between the media and police version of your rights and what they actually are before the Miranda warning. It debunks everyoneÃ¢ÂÂs misguided obsession with avoiding arrest, focusing instead on avoiding conviction by lawfully not giving evidence to the cop.It will help prevent the painful ultimate consequence of cooperating - losing in Court. The cop stopping you may sound friendly,ÃÂ but is not, never was, and never will be your friend! 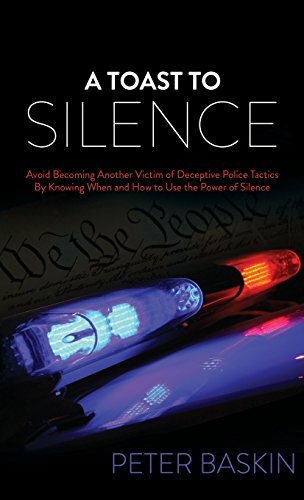 Discover the truth about police deception and how to protect yourself in A Toast to Silence. About: A Toast to Silence challenges and rejects conventional thinking about police encounters, openly stating what is only whispered: the police lie.